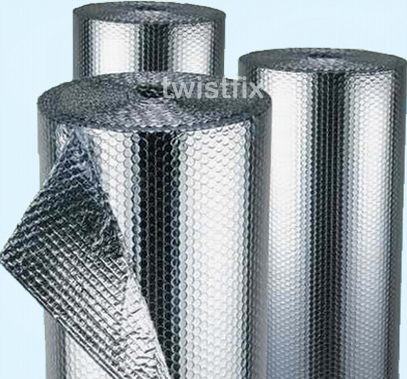 Did you know that you can reduce your carbon footprint and save money by using Foil insulation – Ecoflex from Twistfix? The Ecoflex Foil Insulation is a BRE certified reflective foil insulation that reduces heat loss via infra-red reflective surfaces. This is a high performance bubble foil insulation and vapour barrier having low emissivity air spaces to enhance thermal performance. The foil insulation is remarkably versatile and extremely useful in many different circum­stances. Keeping plants inside warm and insulated so that they can be allowed to grow. When used in lofts, walls or caravans it is equivalent to using 60mm of mineral wool. For floors and cellar ceilings it is equivalent to using 50mm of polystyrene. Behind radiators and greenhouses it is equivalent to 30mm of polysterene. The High performance Insulation is available in 1.25m x 25m rolls (30m2). Twistfix are also supplying a FREE 75mm x 50m foil jointing tape with each roll of insulation.